Why Participate in IT Locator? At The ASCII Group, we are constantly looking to leverage our collective power for everyone’s individual benefit. For 30 years, we have offered our members new and innovative ways to grow their businesses. We are pleased to have helped create from the beginning (and be partnered with) a new offering that we believe will be a game changer in our industry - IT Locator® - an all inclusive, vertical search engine (VSE) for local and regional IT services, software and solutions providers. ITLocator.com profiles local IT Solution Providers - to help people and businesses choose the right professional technology expertise. IT Locator makes the process of finding, researching and selecting IT experts easier by presenting detailed profiles of a growing list of Solution Providers around the world, in a transparent, industry standard format that ASCII has created for the industry. These profiles allow members to define the services, certifications, partners and industries they focus on, while allowing members to upload collateral, case studies and other useful marketing materials to help the market find your business with greater speed and efficiency. Additionally, IT Locator offers social networking forums for directly interacting with the market, full customer rating systems to further promote and distinguish your business and offers an industry first publishing platform that allows members to submit content about their offerings, their perspectives on the IT market and on coming trends that will affect future technology ROI and TCO. In summary, we built IT Locator to help further educate and steer the technology buying market on the value of the channel, its strengths versus direct vendor offerings and to present a single, easy-to-use, socially integrated, efficient interface for technology buys to find the right local technology partners. 1) Leads: IT Locator was built for generating leads. With the depth of content available for our members, the collection of members we have assembled industry wide and globally and with the continual and ongoing promotion deals we are securing with industry leaders like CBS Interactive and C/Net, our focus is to funnel as much research traffic out there from the technology buying market directly to IT Locator and our membership. With interactive forums that allow potential buyers to post questions and seek advice and with ongoing membership created content and industry news, our goal is make IT Locator an increasingly valuable part of your market strategy. All leads are secured and never shared so you can be assured that your efforts in making the most of your presence on IT Locator will benefit you and only your business. We will be continuing to increase these stats and your participation will help ensure that we grow even faster through these highly advantageous content channels; to the benefit of us all. 3) Pass Through SEO Value: In the post-penguin Google world, SEO has become almost exclusively about the quality, relevancy and depth of the content you provide to drive traffic to your site and to your business. Since your detailed profile will be a part of IT Locator, as our organic SEO value grows with increased traffic, so will yours. Whether you have your own site or not, IT Locator will provide a high-density, content-rich association with your business, all of which is given higher value in the contemporary Google search algorithms; and the longer you have been associated with us the better. With a continual churn of new content, new members each offering their own content and the value of social interactions through the site, the SEO value of IT Locator for your own marketing presence will grow exponentially in the months and years to come. IT Locator offers three tiers of membership opportunities for those who want to join us in strengthening the awareness and demand for the local IT reseller community. The Free Membership option is limited in the value it offers and will be the least visible local option show to potential technology buyers visiting ITLocator.com. It also is restrictive in terms of services, industries, partners and certification selections you can associate with your profile and it does not allow you to publish content to the site and the collective membership. The Standard Membership is ideal for smaller resellers who want to define their presence in their local markets (up to 3 locations allowed) and who only want to minimally market their services and solutions in local searches, though contributed content and in IT Locator promotions. 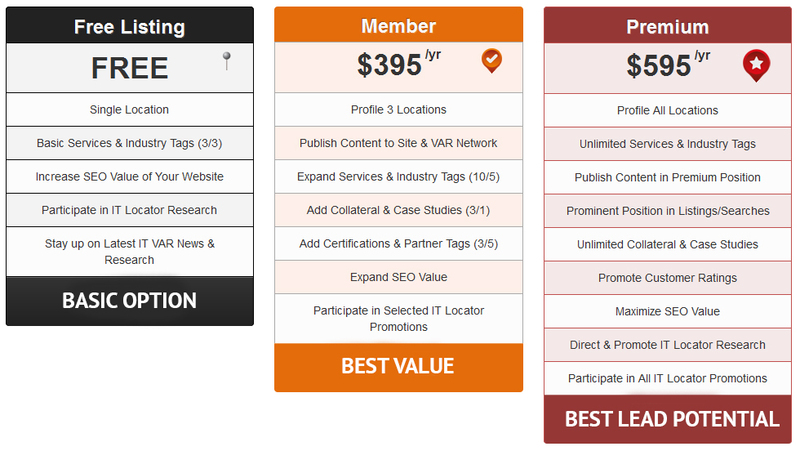 The Premium Membership offers benefits allowing resellers to profile all their locations, to associate as many service, industry, partner and certification selections to the profile as desired to widen their search relevancy and maximize their lead potential through premium placement in all search results and content listings and to actually direct and drive ongoing IT locator promotions, research activities and sponsorship opportunities. As always, please send us any comments, suggestions or feedback you have about the new ITLocator.com site and thanks again for standing with us in the mission to keep technology local, intimate and delivered by experts who take the time and care to deliver the best technology solutions.